No, the image you see above is not a scene from a futuristic sci-fi summer blockbuster. 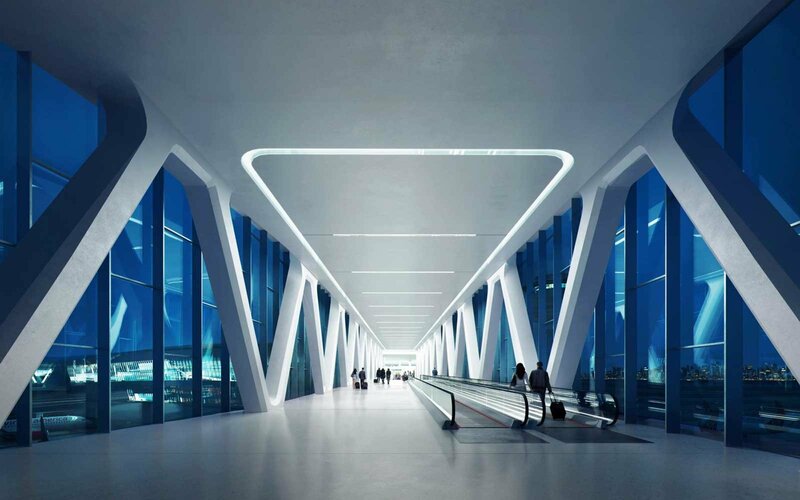 It’s a rendering of a pedestrian bridge inside New York City’s LaGuardia Airport after the $8-billion renovation that’s expected to be completed by 2021, with the first new gates scheduled to open late next year. Located in the borough of Queens, LaGuardia is the smallest airport in the city and the closest one to Manhattan, making it a preferred hub for business travelers. It first opened in 1939 as the New York Municipal Airport and is named after former Mayor Fiorello LaGuardia. In more recent years, it has grown to be despised by New Yorkers for its aging infrastructure, flight delays, cramped terminals, and poor dining and shopping options. LaGuardia has two short runways and depending on wind conditions, sometimes only one runway is open at a time, causing major air congestion and delayed flights. In 2016, more than 28 million passengers flew in and out of LaGuardia, despite it originally being designed to accommodate only 8 million fliers per year. Last year 29 percent of LaGuardia’s flights were delayed, placing it last in a ranking of the largest American airports according to data from the Bureau of Transportation Statistics. J.D. Power and Associates named it the worst airport in the U.S. because of those delays, and in 2014, Vice-President Joe Biden famously likened it to a third world country, a notion repeated by Donald J. Trump during the presidential campaign. On Tuesday New York Governor Andrew Cuomo unveiled the latest designs for the eastern half of the airport development project, a year after he broke ground on the renovation for LaGuardia’s western terminals. PreviousPrevious post: What’s the Most Popular Vacation Destination for Americans? Their Cubicle.